1) A donation of £500 had been presented to the Rosemary Foundation at the Grand Christmas Bazaar on the 3rd of December. A note of thanks had been received from the Foundation. ( See the Notice Board Page ). The Foundation will be giving the club a mention in there next newsletter. 2) The Christmas Dinner at the Hilsea Carvery had been a great success and enjoyed by all. 22 members and 2 guests had been present. 4) The Solent Metal Detecting Club AGM would be held as part of the normal monthly meeting on the 11th of January 2012. 5) The time of year has arrived when existing members need to renew their membership. Invitations will be sent out to prospective members. Membership renewal must be made during December 2011 and January 2012. Applications from those wishing to join the club can now be received, up to and including the monthly meeting on the 8th February 2012. No application for membership will be accepted after that date. 6) The chairman formally thanked the Finds Liaison Officer, Rob Webley for his attendance at the meetings throughout the year. 7) The chairman stated that, for personal reasons, he would be standing down as chairman at the end of this year. Our Finds Liaison Officer was at the meeting to discuss and record members' metal detecting finds. The raffle was held as usual to provide funds for the running of the club. An excellent buffet was provided at the meeting by the Royal Naval Association Club. The next monthly meeting will be held on the 11th January 2012. Wednesday 9th November 2011 club meeting. 21 members and one guest attended our November meeting. As a result of a recent incident, members were reminded that should not carry a detector whilst on private land where there is no permission to search. If you are seen by the landowner he will assume that you are detecting on his land without permission, with the obvious consequences. This applies to public footpaths, which are all on land owned by someone and permission to search is still required. Please note, - Members of the club committee will be attending the Rosemary Foundation Grand Christmas Bazaar at the East Meon Village Hall on Saturday 3rd December 2011 (10.00am to 12.00) The Club will be presenting the Rosemary Foundation with a donation at this event, so it is hoped that as many members as possible will attend. As most of our land is available for detecting at the moment there were some interesting finds being shown and discussed. The monthly raffle was held as usual, with the profits going into the club funds. As always we are grateful to those who buy tickets and those who contribute items for prizes. A number of members have not yet attended the minimum of 3 meetings required to qualify them for continued membership next year. Please check on your attendance record if you wish to be considered for membership again in 2012. Membership can be renewed during December 2011 and January 2012. Application for membership from prospective new members will be taken during December 2011, January 2012 and the time up to, and including, the February meeting on the 9th February 2012. No membership cards for 2012 will be issued after this date. The membership limit has been increased to 50 so there will be a number of places available. However, there is already a very large waiting list. Membership invitations will be on a strict date order from this list. If your name is on the list, and a place is available for you, you will be contacted by the club in due course. Wednesday 12th October 2011. Attended by 21 members and one guest. As a result of the involvement of some club members with beating for a game shoot, the contact with the farmers has resulted in the possibility of new land for detecting. We have yet to talk to the farmer to settle the terms of the agreement, but we are hopeful that a new farm will soon become available to the club. The schedule of club digs for October/November was issued, but members need to note the following. Site U has been seeded but is OK to detect on, on 16th of October. Site Z is scheduled for the 23rd of October, but please do not detect on any land that has been seeded. Site T has been seeded so is unavailable for detecting until further notice. The Rosemary Foundation Grand Christmas Bazaar will take place at East Meon village hall on Saturday the 3rd of December 10.00an to 12 noon. The club will be presenting a cheque to this charity at this event and it is hoped that as many members as possible will attend in support. Also on the 3rd of December will be our Christmas Dinner. This year we will be at the Toby Carvery, Green Farm, Hillsea. The cost will be from club funds, although guest of members will be required to pay. Places at this event have now been booked. One of our lady members will be taking part in an Aerobathon to help raise money for a cancer charity. The club supported her by taking a collection from members at the meeting. The resulting donation of £31.50 was presented to the lady member, who wished to say a big thank you to all those who contributed. Our FLO attended the meeting and was kept busy all evening looking at, and recording members finds. As a small 'thank you' for attending our meetings and supporting the club the FLO was invited to the Christmas Dinner. The raffle was held as usual and continues to generate an income for the club. Please note:- the raffle organiser would be grateful for any contributions, from members, for use as prizes. A reminder to members, - to continue membership you must have attended at least three of our club monthly meetings this year. Wednesday 4th September 2011. This meeting was attended by 22 club members. -- The Chairman opened this meeting by covering the following issues. The club's attendance at the Possingworth Rally had gone well in spite of the rain in the afternoon. Some tokens and some interesting items had been found by members. The event was considered to be a success. The Chairman thanked the member who had organized the minibus and also thanked him for cleaning it after the event. Almost half of the membership had attended the event, but we hope to see an even bigger turnout at the next rally. For a brief report and photos of this rally, click here. The time has come for members to put there names down for this year's Christmas dinner. This has to be booked quite soon and members are asked the let the organizer know as soon as possible if they will be attending. The venue for the dinner and the menu available will be given out at next months meeting. At this time of year, with fields being ploughed and re-sown it is difficult to keep track of those fields that are available for detecting. Therefore, any member who attends a dig, and those members who pass by the farms, are asked to report back to the club on the state of the fields. This information will hopefully be passed on the other members and will help in compiling the schedule of club digs for next month. If you see fields that have just been harvested or fields that are freshly ploughed or sown, let the club know. The information on 'tracer pebbles' as detailed below, was passed on to members at the meeting. Hopefully all members will become aware of just what these objects are and when found, they will replace them, as found, in order to minimize the effect on the beach surveys being carried out. The treasurer has stated that the clubs funds are in good order and there is enough in the charity fund to enable us to make a donation to the Rosemary Foundation. It is hoped that the presentation of the cheque to the foundation will be made at this year's Christmas Bazaar, which will take place at the East Meon village hall on Saturday the 3rd of December between 10.00am and 12.00 noon. Once again your support for this event is requested. The meeting continued, with the raffle after which members discussed the finds that had been made at the Possington rally and finds that had been made elsewhere during last month. Please note that the FLO will be in attendance at next month's meeting and will be available to discuss member's finds and record any historic artefacts on the PAS database. At this time of year there is the reminder to all members that they must attend a minimum of three of our monthly meetings in order to be eligible for continued membership next year. Some of our members have been finding 'tracer pebbles'. while beach detecting. These are marked pebbles, either natural or artificial, which have been placed on the beach as part of a study of material movement on the beach, in particular 'longshore drift'. Several organizations are currently conducting these surveys locally. The pebbles can be of several different forms. Natural pebbles are used, - hole is drilled in the pebbles and a copper rod is inserted and the holes resealed. Also, 'smart pebbles' are used. These are natural pebbles with an active electronic circuit placed in the hole and sealed in. Aluminium pebbles have been used in some studies. Artificial pebbles consisting of a pebble shaped piece of resin containing a large piece of copper rod are also being used. These pebbles, with the possible exception of smart pebbles, will be inscribed with a number or some form of unique identification. Many hundreds, if not thousands of these are placed on the beach, so it is quite likely that you will find one. These studies are being carried out on beaches along the south coast, including Hayling Island. The best course of action, if you find one, is to replace it in the same position and at the same depth as you found it. Research into longshore drift is being carried out by the University of Sussex. 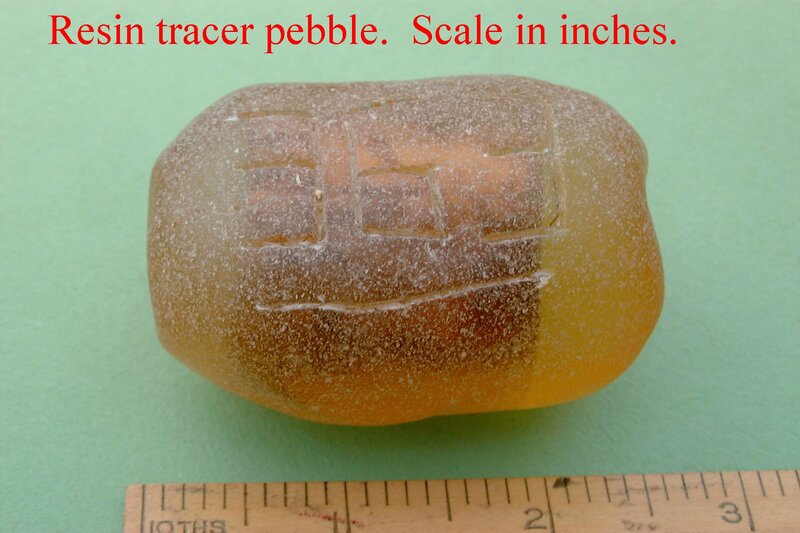 They are using resin tracer pebbles as shown in the picture below. These contain a large piece of copper rod, so will be easily detected. Brighton & district MDC rally at Possingworth Manor House. Sunday 4th September 2011. - About 18 members attended this rally, most going by minibus provided by the club. The rally was from 10.00am to 4.00 pm, giving just 6 hours to cover the 65 acres of land adjacent to the manor house. One field was clear of crops and had been harrowed. The sandy soil was dry and soft making ideal conditions for recovery of anything detected. Two other fields had some stubble and weeds, but were still good for detecting. The east field contained a large amount of junk, seeming left over from WWII. The Brighton club said that about two thirds of the area was undetected as there had never been a time when these particular fields had been without crops. Up until about 1.00pm the day was dry, but then the black clouds came and the rain fell. The rain stopped at about 3.00pm giving one remaining hour for searching without getting wet. By this time, many people had left. The event was reasonably well organized, but the finds were few considering the history of the area and the extent of the undetected land. If you want to check up on the history of Possingworth house, you could go to the parksandgardens web site. Read this News page later for more information on what was found. To see a slide show of the event, go to the Photo gallery page, click on gallery 2 link at the bottom of the page, Click on Gallery 2, then rallies, then Posingworth Rally slide show. Monthly meeting 10th August 2011. Today's meeting was attended by 21 members of the club. Our Finds Liaison Officer was in attendance and was kept busy with recording members finds. With crops being cut at this time of year we have a short time when fields will be available. Once the next crop is sown the fields will, once again be out of bounds, so take the opportunity to go to the farms while you can. Details of the land available for the next 5 weeks is given on the Notice Board page ( scroll to the bottom ). Arrangements were made for the Brighton and district Metal Detecting Club Rally at Possingworth Manor on the 4th of September. There were two accounts of requests by the public to search for lost rings, both were successful and resulted in a generous donation to the charity we support, the Rosemary Foundation. Congratulations and thanks to those involved. Our monthly raffle continues to provide funding for the club. Our next meeting is on the 14th of September. You are reminded that you need to attend at least three meetings per year in order to continue membership of the club. July 2011 monthly meeting. - held on the 13th of July 2011. There were 21 members attending. Once again, due to growing crops and no access to set-aside land, we have a limit to our farm availability this month. You will find the scheduled detecting sites for this month at the bottom of the Notice Board page as usual. There was considerable interest by members in the Brighton MDC rally at Possington. The cost is £15 pounds and the transport will be provided out of club funds. More details will be provided when we have managed to contact the organizers! An idea was put forward that we plot our finds from our detecting sites on a large map. This can be done individually or on one map. We have had no response yet from our various efforts to acquire more detecting land but 'watch this space'. There was little interest in attending the Finds Event at Arundel Castle (See the Notice Board page, but if anyone does go, can we please have a report ! We are hoping that this Event, which will eventually become a high profile ITV TV programme, will put a correct and positive slant on the hobby of metal detecting and that the producers will not be taken in by the wiles of our detractors. The treasurer gave his report and stated that there would soon be enough in the charity funds for us to make our usual donation to the Rosemary Foundation. Also, we have made our usual donation to the RN Association Club who allow us to use the room for our meetings. We have had yet another request to find a lost wedding ring. A few members have volunteered to search the garden concerned and, once again, we hope for success. Locating and returning lost property is just one of the ways we can can publicize the hobby of metal detecting in a good light. Our club income from the raffle continues to be good. Once again, if anyone has anything suitable that they can donate as a prize, please bring it along to the next meeting. The next meeting will be on the 10th of August 2011. June monthly meeting. This meeting was held on the 8th of June. It was attended by 19 members and one guest. The chairman's opening address covered the following. Site X would become available for Sunday detecting on the 3rd of July, but be aware that there will still be lambs in the fields. Please avoid disturbing them. Site X will be open for Wednesday detecting on the 6th of July. We are still trying to negotiate an exchange of detecting visits with the Sussex Dowsers. The club is hoping to get together a group of members for a rally ( Brighton, 4th September ). Contact the club for details. The treasurers gave a report on the club's financial state. We are in sound financial position and are building up both the club funds and the charity account. Our Finds Liaison Officer was available at the meeting to identify and record finds and was kept quite busy by members in spite of the limitations on the detectable available land that we are experiencing at the moment. The raffle was held as usual and gave a good profit for club funds as members were ready to support the club by both buying tickets and donating items. Please note:- The next monthly meeting will be held on Wednesday the 13th of July. May 2011 meeting. The monthly meeting for May was held on the 11th May at the usual venue. 20 members attended. The lambing season still prevents some of our land from being used. This restriction will probably be lifted at the end of May, but this will be confirmed at the next monthly meeting on the 8th of June. Meanwhile we are restricted to just two detecting sites. In spite of the lack of land to search there were still a few good finds on display at the meeting. The raffle was held as usual. The Rosemary Foundation is looking for ways to obtain funding and they have been reminded that if they can find land for us to search there would be a small income from the club as a result and possibly more substantial donations if any articles of value were to be found. Members are reminded that the Finds Liaison Member Rob Webley is due to attend the next meeting, so bring along those finds for identification and recording on the PAS data base. April meeting. This was held on the 13th April. The meeting was attended by 19 members. Members were reminded that, when attending the meeting they were required to sign both the venue book and the Solent MDC register. The list of detecting sites available for this month hade been sent by post to all members to ensure that everyone was aware of the ban on some farm sites due to the lambing season being in progress. Copies of the site lists were also available at the meeting. As a result of land being seeded and the lambing season there is no land available on Wednesdays or on the 24th April and the 1st of May. The Finds Liaison Officer ( FLO ) Rob Webley was present at the meeting. He was introduced to new members and the PAS scheme briefly described. Rob was available to receive finds and was kept quite busy during the meeting with finds from the last month. There was a request from some members for copies of the Detecting Site maps. Members are reminded that a set of maps is issued free to new members , but a fee will be charged for replacement maps to cover the cost of photo copying/laminating as required. Members of FID will have seen an article in the Spring 2011 of the magazine from a FID member requesting identification of a 'HMS Victory pendant' that he had found. One of our Solent club members was able to positively identify the item as the broken-off handle of a toasting fork. An email on the subject has been sent to Colin Hanson at FID along with photos of the toasting fork. The raffle was held as usual along with, once again, a request for members to donate items for the raffle, with a reminder that the proceeds of the monthly raffle are the main source of income for the club finances. The membership of the club now stands at 41. There will be 9 places available in January 2012 when application for membership opens once again. There are currently 4 names on the waiting list. March meeting held on the 9th of March 2011. This meeting was attended by 22 members. In his opening remarks, the chairman welcomed the new members. The warden system at the dig sites was explained and it was confirmed that wardens would be present at all the site digs for this month. Mention was also made of the Sussex Dowsers presentation to be given by Laurie Booth on the subject of "Exploring Archaeology". This will take place on Sunday 13 March 2011. "Dowsing for Water, including map dowsing, is widely accepted as valid because water is found. Archaeological dowsing is proving just as verifiable. Laurie Booth, an active member of the BSD Archaeological Special Interest Group, will share the exciting discoveries he has made, his work with local archaeologists and historians, and the lessons learned. He will cover how to target your questions, and hints and tips for successful archaeological dowsing." This meetings start at 2pm; doors open 1.40pm. It will be held at The Bassil Shippam Centre, Tozer Way,St Pancras, Chichester PO19 7LG £5 non-members, £3.50 members. Refreshments available and Dowsing Practice after tea. The retiring chairman was presented with bottles of wine, and our gratitude for her support of the club for many years was expressed by the members. The raffle was held as usual and members were asked to support the raffle and to bring along any item for inclusion in the raffles such as unwanted gifts etc. By supporting the raffle you will be providing the income which enables the club to function. Members were reminded that other incomes, such as the dig fees go to charity. Please note that the next meeting will be held on Wednesday the 13th of April 2011 and our Finds Liaison Officer will be in attendance to record and give information on members finds. February 2011 meeting. Wednesday 9th February. This meeting was attended by 23 members and 2 guests. A number of new members were welcomed. ( Please note, this completes the intake of new members for this year and no new members will be taken on until January of 2012 and only then if places become available. ) A report on the recent game shooting beat attended by members of the club was given. The Finds Liaison Officer ( FLO ) Robert Webley was in attendance to record members finds. The monthly raffle was held. Please note, - any contributions for the prizes for the monthly raffles ( for example old metal detecting magazines or books, unwanted gifts etc ) would be welcome. A new map for Site Z was issued and members were reminded that this map, dated 3rd February 2011, must be used in place of any existing maps until further notice. Only the green shaded areas may be detected. Also, it was pointed out that members should arrive at the detecting sites between 9.00am and 9.30am where a warden would be present to make a note of those members present and take the £3 fee. Next meeting, - 9th March 2011. Apologies, Chairman's report, Treasurer's report, Election of the committee, Changes to Club rules, Voting on rule changes, Farms and newly acquired land, Any other business, Motions to the meeting, Conclusion of business. As the current chairman was resigning and more committee members were needed, the main business of the meeting was to elect the new committee. A total of 5 members volunteered. The new committee now consists of a Chairman, Secretary, Treasurer, Farms liaison officer, and A Raffle Organizer. The retiring Chairman kindly agreed to be retained as a consultant to the committee. 1) Membership limit to be increased to 50 full members. 2) Annual membership fee to be increased to £10. 3) To retain membership, members must attend three meetings during the year, and record their attendance by signing the club signing-in-sheet. 4) Free Junior Membership introduced for relatives of full members. 5) All requests, received by individual members, for the the Club, to search for lost items, must be referred to the committee before starting the search. After the formalities of the AGM business, the meeting continued with the usual showing of finds and the raffle. To see the archive of the News page for 2010 - click here.